Alfalfa stands are typically terminated by herbicides in Wisconsin. While many options are available, combinations of 2,4-D and glyphosate are most commonly used. With the availability of Roundup Ready alfalfa, concern about removal exists. While previous research has reported successful removal with combinations of 2,4-D and/or dicamba ( at least 1.0 lbs ae/A recommended) poor stand removal has been reported in no-till Roundup Ready alfalfa stands. Research was initiated in the fall of 2012, to test different timings of Roundup Ready alfalfa removal and continued management in the next year’s crop (corn). Removal treatments consisted of 2,4-D (2 pts/A) or 2,4-D (1 pts/A) + dicamba (1 pt/A) and were applied in the fall (11.5.12) or spring (5.1.13) when alfalfa was 3–5 inches in height. Applications were late in the fall as alfalfa was drought stressed ad required time to regrow. Spring applications were also delayed to allow for regrowth. 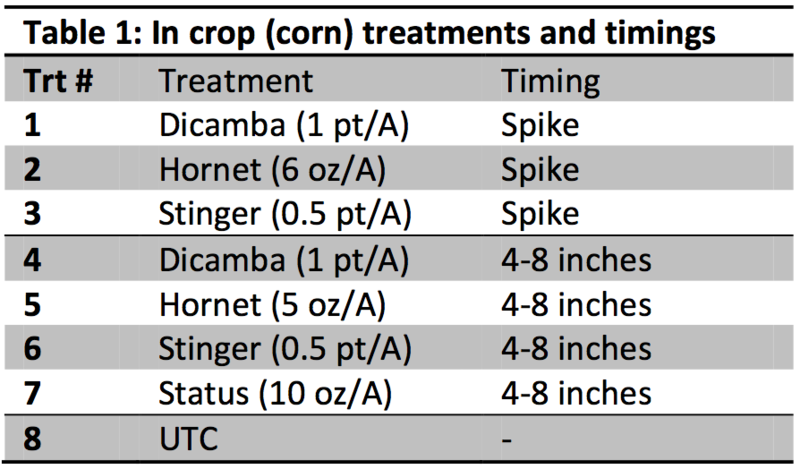 In crop treatments (table 1) were applied within each removal treatment after corn was planted (6.14.13) when corn was at the spike stage (6.18.13) or 4–8 inches tall (TBD). All treatments included a nonionic surfactant at 0.25 v/v and AMS at 8.7 lbs/100 gallons. Fall timings initially were effective, but by late May 2,4-D treatments had 83% alfalfa cover. Adding dicamba to 2,4-D in the fall increased suppression, but alfalfa cover was still >50% by late May. This contrasts previous work in 2006-7 that showed >95% reduction of alfalfa cover by treatments of 2,4-D, dicamba, or combinations of the two the previous fall. Spring treatments were effective when 2,4-D was combined with dicamba as suppression was near 100% through May. Based on previous results we expect some alfalfa plants to recover by 2 month after the spring treatment. Corn planting was delayed to accommodate the plantback interval for 2,4-D (7-14 days) and weather. All treatments, EXCEPT 2,4-D and dicamba, were considered failed removal by the time corn was planted. While alfalfa control and its impact on corn growth will continue to be monitored, this project emphasizes the importance of actively growing alfalfa plants for successful removal with herbicides.